Drama reaches High Court. Draynoff demolition is set to start, Netanyahu says he hopes court will cancel demolition orders. Prime Minister Binyamin Netanyahu said Tuesday that he does not want to tear down the Draynoff compound in Beit El. “We are working to strengthen the settlement enterprise, and doing so while obeying the law,” he said. Meanwhile, however, actions on the ground indicate that security forces are preparing for demolition of the homes, pending a High Court decision. Border Police seized control of the compound overnight and evicted dozens of youths who had been squatting inside. The Prime Minister's Office said that Netanyahu spoke with the Attorney General again about the matter Tuesday morning. A senior security source told Arutz Sheva that since the IDF Civil Administration approved the construction of 24 housing units at the location last week, and since residents had filed a High Court motion against the demolition, the demolition will be carried out if the High Court says so. "We are still inside the legal process,” he said. Police closed off entry to the road that leads to Beit El, in the Binyamin region north of Jerusalem, Tuesday morning. 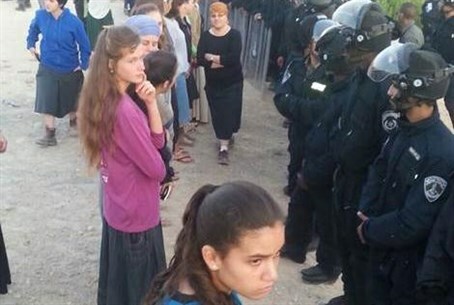 While Arabs may pass the roadblock at Givat Assaf, Jews who do not live in Beit El may not. Heavy machinery has been parked at the Beit El junction – apparently awaiting the green light to begin demolition of the contested Draynoff houses. Jewish Home Chairman Naftali Bennett and other ministers from Likud and Yisrael Beytenu called on Netanyahu to prevent the demolitions.